Tom Morgan Rodsmiths has announced the opening of a new shop in Bozeman, Montana, under the new ownership of Joel Doub and Matt Barber. Tom had never built a rod when he purchased R.L. Winston in 1973, but over the course of 45 years, he became an icon in the fly fishing industry. Quite simply, Tom worked tirelessly in pursuit of building the perfect rod. Tom Morgan Rodsmiths evolved from a dream of Tom’s while owning the R. L. Winston Rod Company from 1973 to 1991. He always wanted to build a limited number of superior graphite rods for appreciative anglers. Rods not limited by cost or materials. Rods he would fine-tune until their actions were perfect. Originally, Tom planned on making these rods himself, but then life threw him a twist. Tom developed MS and would be unable to keep up with the physical demands of rod making, faced with a decision on whether to continue his life’s work, a solution presented itself. Gerri Carlson and Tom met and became partners in life and in the Tom Morgan Rodsmiths Company. Over time Tom and Gerri added bamboo and eventually fiberglass rods to their lineup. A small group of craftsmen ebbed and flowed through Tom’s shop wanting to work with and learn from Tom. They, along with Gerri, became Tom’s hands and brought his vision to life. Many of them have gone on to build and sell custom rods of their own. Tom also had a team of dedicated casters who developed prototypes under his watchful eye and gave him the feedback that he could no longer gather for himself. While other rod companies chased a demand for stiffer and stiffer rods, Tom worked hard to keep the same progressive action that he developed while at Winston. His rods possessed a smoothness and his signature light, lively feeling so prized by anglers worldwide. He sought designs that emphasized continuous taper blanks with a commitment to the importance of a sensitive tip. He added the best components he could find, from a carefully chosen group of suppliers committed to making the very highest quality products. Now there is another exciting chapter in Tom Morgan Rodsmiths story. Tom and Gerri sold the company to Joel Doub and Matt Barber, two life-long fishermen committed to the preservation of the Morgan legacy. 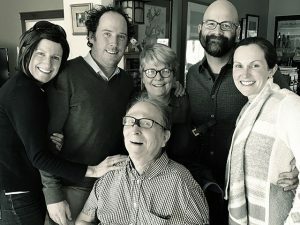 They moved with their families to Bozeman from Denver, and are honored to be stewards of the company as Tom envisioned it. As such, TMR will remain a small company, and will continue to provide the unprecedented quality the brand is known for. In support of what Tom created, the team of rod builders remains intact and all of Tom’s suppliers have committed to provide the same high quality components to ensure the success of TMR. The new shop is located at 608 W. Griffin Dr. in Bozeman, MT 59715. Sadly, Tom passed away on Monday, June 12th, 2017 of pneumonia. While he is no longer with us, his legacy in rod design will touch anglers for generations to come. Please visit our website at www.tommorganrodsmiths.com to check out our rods or reach out to info@tommorganrodsmiths.com with any questions. 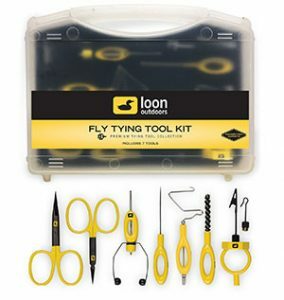 Loon Products has announced the release of their new Fly Tying Tool Kit. The kit includes necessary tying tools as well as a heavy duty travel case. Packaged in a heavy duty travel case and featuring the Ergo Arrow Point Scissors, Ergo All Purpose Scissors, Ergo Bobbin, Ergo Bodkin, Ergo Whip Finisher, Ergo Dubbing Brush and the Gator Grip Dubbing Spinner, this is an excellent choice as a gift for the first-time tyer, or the long-time tyer who wants to trick out his bench with something new. Includes Gator-grip, Ergo Whip Finisher, Ergo Dubbing Brush, Ergo Bodkin, Ergo Bobbin, Ergo Arrow Point Scissors and Ergo All Purpose Scissors. This most recent video from Jazz & Flyfishing features four days of fly fishing with friends in Finnmark. There’s a lot to like about winter fly fishing, and one of those things is midge hatches. Spencer Durrant outlines this top five dry fly picks for winter fly fishing conditions via Postfly Box. Avedon & Colby Outfitters has announced their new Linen Signature Field Shirt, based on their original Bush Poplin Signature Field Shirt, this version is sewn from 100% linen fabric designed for comfort and function while bonefishing. (Black Earth, WI) Avedon & Colby Outfitters’ new Linen Signature Field Shirt just might be the most comfortable and functional bonefishing shirt ever devised. 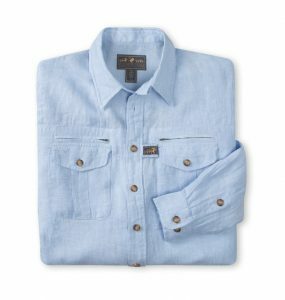 Based on the original, award-winning Bush Poplin Signature Field Shirt, their latest version is sewn from 100% linen fabric in two fishy colors — khaki and light blue chambray. Linen has been regarded as the preferred fabric for tropic climates since the days of the Egyptian pharaohs. Made from the fibers of flax plants, it’s expensive and difficult to manufacture, but the result is a strong, abrasion-resistant, long-staple fabric that is cool to the touch, ultra-absorptive, and incredibly smooth and comfortable to wear. Unlike cotton or synthetic fabrics, linen has the ability to absorb moisture without feeling clammy next to the skin — and rapidly “lose” it through evaporation, while cooling the wearer. When the weather turns cool, or when running out to the flats at daybreak, the fabric retains body heat far better than cotton or synthetics, too. Retractable Bi-Swing Back: A generous, full-length bi-swing back extends from the top of each shoulder to the waist and expands to prevent pulling on the sleeves when arms are thrust forward when casting or fighting fish. A unique, elasticized mesh panel inside the shirt reseats the bi-swing pleats to their original position to prevent ballooning and maintain a trim, snag-free profile. Moisture-Wicking Mesh: The elasticized 100% polyester mesh half lining on inside of the shirt back wicks sweat away from the wearer’s skin and out to the linen shirt material to accelerate evaporation and cooling. Double-Reversed Underarm Gusset: A revolutionary new underarm gusset design allows for complete freedom of arm movement by preventing any pulling on the shirt’s sleeves when arms are raised or rotated when fly casting or fighting fish. Side Panels: Tailored side panels replace traditional side seams (which are cheaper to sew) to separate the front and rear shirt panels and prevent transfer of torque so the shirt body does not twist or pull when casting, stripping line or releasing fish. Pivot Sleeve: Each sleeve seam follows the arm-motion pivot points to reduce cuff “pull-back” and waist “pull-out” while allowing arms to move freely. Articulated Elbows: A sequence of small pleats at the elbows help prevent the shirt cuffs from pulling back and binding when fly casting. Sleeve Roll Tabs: Extra-long concealed sleeve roll tab loops, exterior buttons and a full 7″ sleeve placket accommodate rolling up sleeves without binding. Sun Collar: A flip-up collar extension helps prevent sunburn on the back of the neck. Constructed with a military-style “zig-zag” stitch to keep it rigid without adding additional thickness or weight, the sun collar stays up without curling or folding back on itself. Genuine Bellows Pockets: Generous, functional (not decorative) box pleats on each breast pocket allow for expanded capacity. Zippered Security Pockets: Concealed, corrosion-resistant, solid-brass zippers secure two hidden pockets behind each breast pocket for safekeeping a passport, cash, wallet or other valuables. Cloth panels sewn on the inside of the shirt support the zippers to prevent sagging. Hidden Button-Down Collar: Hidden buttons secure the shirt’s collar tips to prevent them from flapping against the wearer’s face and neck in high winds or when running at high speeds. Dress Shirt Construction: All seams are single-needle stitched and surged to prevent any fraying of material. Horn & Urea Buttons: Stronger and much more durable than traditional plastic buttons, the Signature Field Shirt buttons are molded from ground horn powder and urea-methanol resin with raised button rims protect the thread from abrasion. Available in Men’s Medium to XXLarge — and Large and Extra Large in Tall — in khaki and light blue chambray and retailing for $198, the new Signature Linen Field Shirt can be ordered on the Avedon & Colby website: www.avedoncolby.com. Burt Avedon: After a distinguished career as a Navy fighter pilot serving in combat during both World War II and Korea – and later as a Top Gun instructor and a bush pilot/professional hunter in British East Africa, Burt purchased the original Willis & Geiger in 1978 after it went bankrupt following the collapse of Abercrombie & Fitch, the company’s largest customer. He successfully revived the company by re-introducing improved and entirely new versions of many of the iconic Willis & Geiger styles that outfitted adventurers and explorers like Teddy Roosevelt, Ernest Hemingway, Charles Lindbergh, Amelia Earhart, and many others. Willis & Geiger was purchased by Land’s End in 1996 and closed during a company-wide downsizing in 1999. After several unsuccessful attempts to purchase the iconic brand from Land’s End, Burt, and his longtime design partner Susan Colby, launched their design and consulting firm, Avedon & Colby, to create premium performance wear and accessories for leading outdoor and lifestyle brands. Susan Colby: Susan joined Burt at Willis & Geiger in 1986 with an art degree from Smith College following a successful career as a member of Westinghouse’s Design Center, Associated Merchandising Corporation, and finally as a designer and buyer at Paul Stuart/NYC. Together, Burt and Susan designed garments and accessories for Willis & Geiger that blended the classic good taste of a bygone era of wilderness exploration with high-performance features never before seen by outdoor enthusiasts. They continued this tradition after the close of Willis & Geiger, designing premium-performance clothing and accessories for leading outdoor and lifestyle brands like Orvis, Beretta, Woolrich, King Ranch, Kevin’s and Eddie Bauer. Cold-weather fishing brings some benefits, one of which is fewer anglers on the water. But it also brings dangers from the elements as well. In this article, Vince Puzick of Angler’s Covey details prevention and treatment of hypothermia for anglers who head out on the water during winter months. Any small caddis larva is a great starter pattern for new tiers. This week Tim Flagler offers tips on how for novices and experts alike as he shows the steps for tying a Micro Caddis Larva. In this short film anglers put in the legwork to fish for bull trout in one of their last bastions within a pristine wilderness. “Merging different backgrounds and unorthodox fly fishing techniques, they experience a fishing trip that piscatorial dreams are made of.” An official selection of the 2018 International Fly Fishing Film Festival. “Confluentus” (Trailer) – Official Selection, IF4™ 2018 from IF4™ on Vimeo. Al Perkinson, Executive Vice President of Marketing at Simms Fishing Products, has joined the board of Bonefish & Tarpon Trust, a non-profit science-based organization dedicated to conserving and restoring bonefish, tarpon and permit fisheries and habitats through research, stewardship, education and advocacy. Prior to joining Simms in 2016, Perkinson served as Vice President of Marketing for Costa, where he helped increase the company’s sales 1500% during his 11-year tenure. He also created Costa Films and has produced nine short films, one of which won the sustainability award from Sundance in 2012. Perkinson majored in sculpture at North Carolina’s St. Andrew’s University before earning a master’s degree in arts administration from Columbia University. He began his career at Ogilvy & Mather Advertising in New York City. Before joining Costa, Perkinson was Vice President of Account Service at Henderson Advertising and VP Group Brand Manager at Bank of America. Widely regarded as one of the most influential people in fisheries conservation, Perkinson received the Lefty Kreh Sportsman of the Year Award from Bonefish & Tarpon Trust in 2014 and was named Angler of the Year by Fly Rod & Reel in 2015. He is also a member of the Explorer’s Club in New York City.